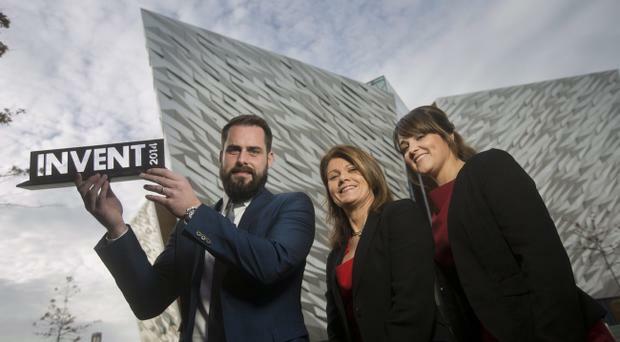 Co Antrim based Plotbox has been crowned Northern Ireland's next big business innovator after their 'Google Maps for cemeteries' won the Northern Ireland Science Park's INVENT awards. The company, from Portglenone, defeated almost 100 other competitors to scoop the prize at the awards, run by NISP Connect, in Titanic Belfast last night. The firm, owned by Sean and Leona McAllister, is a cloud platform for cemeteries and crematoria which aims to fix the day-to-day problems of managing a cemetery. Their system allows cemeteries to set a geographical overview of their burial plots, and the information surrounding those plots, such as the person buried there and their details. It was the "huge global potential" of Plotbox that put it above the rest of the competition, judges said. Steve Orr, director at NISP Connect, said the firm have a great team, are hungry for success, and most importantly have a great idea. "Plotbox takes a modern-day problem-solving approach to a very traditional industry in which there is a general lack of tech savvy. "Over the course of our mentoring with them, they have demonstrated that they not only understand this niche market, they have successfully sold their service to a number of customers already and there is clearly a demand for this innovation," Mr Orr added. William Wright CBE, founder of Wrightbus, was given the 2014 Innovation Founder award, which celebrates the achievements of some of Northern Ireland's most successful entrepreneurs. Plotbox's journey began after the cemetery in the couple's area asked them to create a map for them. While doing this they discovered the bureaucratic nightmare people faced when trying to find a grave. They decided, with their surveying background, they could find a more cost-effective solution than trawling through reams of information from many different places. In an interview with the Belfast Telegraph earlier this year, Sean McAllister described how the company was embracing new technology. "We decided to hire drones. While once the mapping process took 100 hours, we can now do it in two hours. "The drone takes aerial photographs and those can be uploaded straight away, rapidly capturing all the data that we need in a fraction of the time it used to take. "At the moment we are still hiring drones and investigating which models best suit our needs, with a view to purchasing one of our own. "We also have a number of other processes and technologies and work that we can do in the field which no one else is doing." The winner of last year's INVENT award was ProAxsis, which is developing a range of diagnostic tests for routine monitoring of patients with chronic conditions such as cystic fibrosis. Steve Orr praised the innovative work achieved by Northern Irish businesses and those that entered the competition. "Right from the beginning we were enormously impressed with the ideas, concepts and inventions, all with great potential to become successful commercial businesses," Mr Orr said. Other winners at last night's event included Inlifesize in the Creative Media and Consumer Interest category, Green Sword in the engineering category, See.Sense in electronics, Vaccine Tabs in Life and Health, Microbial Nematicides in Agri-Food and Plotbox in Enterprise Software. They each get a share of the £33,000 prize fund and go on a week-long visit to San Diego and San Francisco in December. The student award was won by University of Ulster student Karishma Kusurkar and her company One Square, which specialises in print and accessories design.